My cute little blond niece came out to the bus with me to retrieve Julianna, who greeted her with all the enthusiasm of a 4-year-old receiving a surprise visit from a cousin. The bus was late, so the rest of us had eaten already, and my sister sat at the head of the table nursing the baby and flirting with Julianna while I took Nicholas upstairs for nap. As I came back down the stairs, I saw my niece regarding Julianna carefully. “How old is Julianna?” she asked. “Four,” I answered briskly on the way to putting dishes in the dishwasher. My sister and I both saw the look in her eyes. I’m four. Why isn’t she talking? I noticed, but I didn’t think much of it until my sister called yesterday and said, “I could see the gears spinning. It won’t be long before she starts asking questions.” It sounded like a prospect she didn’t relish. Christian and I have been talking very matter-of-factly to Alex about Down syndrome almost since the day Julianna was born. I say “almost” because for the first week or two we couldn’t mention it without breaking down. So we held back from talking to our impressionable toddler about it until we could keep it together. 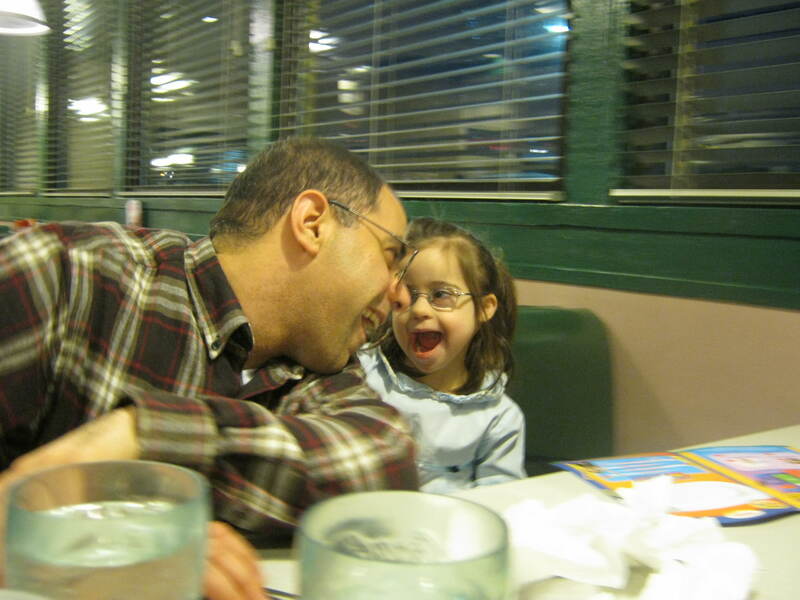 Still, for all of our children, Down syndrome has been a natural part of the family tapestry for their entire lives. This is a deliberate choice. Julianna should not be defined entirely by her extra chromosome, but the reality is that Down syndrome shifts the way she experiences life, and thus, shifts the way we experience life, too. Someday, she’s going to get big enough that we’ll have to gauge carefully whether she feels stigmatized by the hulking Down Syndrome Awareness all around her, and adjust accordingly. But mostly, it seems to me that it’s better to lay it all out there in as non-dramatic a way as possible for people. (Remember “To Tell or Not To Tell?” and my answer to that question?) Otherwise, the elephant in the room becomes even more uncomfortable—how can a person function normally in a conversation while pretending not to notice that there’s something different about your child? This is one of those walls: by avoiding the topic, we overly stigmatize what is, as far as Julianna is concerned, a completely normal life experience. After all, she does all the same things her cousins do (“we’re more alike than different!”)—she just does a lot of them later. So here’s what I told my sister: Don’t avoid the subject. Just say it directly, without fuss. We are all made up of tiny things called chromosomes, and Julianna has one more than we do. This is called Down syndrome, and it makes her learn things more slowly than you do. As they get older, we can get into more depth if we need to. All right, DS lurkers—you can’t hide anymore, I know you’re out there, because I met you. 🙂 I need you to weigh in. Mine is not the only opinion in town. What would you say to all the readers whose lives don’t revolve around DS? How would you advise people to handle the passage of this knowledge? I love the way you said it. I appreciate you sharing. We don’t have Down Syndrome. But we have Autism in the family. I know it’s not the same thing, but it’s been a struggle just the same. My daughter, Dani, is 10 weeks younger than her cousin who has Autism. I am pleased that it hasn’t impacted the relationship between my kids and their cousin negatively. but, like you, since the diagnosis, we’ve simply incorporated that it’s a part of their cousin (“God gave this gift to her”) and as a result of her Autism, she interacts, plays, communicates a bit differently. I realized after I posted that I should have made it clear that this same advice applies to any disability. Sorry! Kate–I think your response is perfect. The entire world would be a better place if everyone would look people in the eye and not be afraid to say things the way they are. I agree 100%. I like what you said about it being Julianna’s normal life experience. Our Luke is normal. He is a normal child who has Down syndrome. We talk to our 5 and 2 year old children about how everyone is different and how blessed we are to live in a world where being your own person is accepted. If Gwen (5) says something about Luke growing up to be “just like Daddy,” that is when I remind her that Luke isn’t going to be just like Daddy just like she isn’t going to be just like Mommy either. We also use the “speed” idea… everyone moves and learns at different speeds. Someone suggested that to me and it seems to make sense to her. I saw the link for Nella’s story on another blog. I’m not sure if you’ve ever read it, but it is so beautiful that I had to share. Warning: it may require a large box of Kleenex. Yes, I read Kelle’s blog for a long time. She’s done a lot of good for DS awareness. Here the disability is Autism, not DS. DS is visible, and while it leads to pigeonholing those who have it, it also leads to a certain understanding among those who recognize the physical characteristics. Autism has no distinguishing physical characteristics and so what people see is someone behaving inappropriately. I got lots of those “your child isn’t raised right” looks from strangers when he was in elementary school; now that he is over six feet tall, people seem to be better at realizing there is something wrong,not just bad parenting. My son was nine before he was diagnosed, and honestly, we haven’t talked about it much at home. We are in the process of moving from high school to adult life,and part of that is applying for Social Security Disability and state vocational rehab services. We’ve always concentrated on what he can do, and have never really gotten involved in the autism community, so when they asked about his handicap, he said “I’m not handicapped”. I’ve explained some of it, but I don’t want to give him a litany of things he can’t do, or make him think he isn’t capable, because he is. I also struggle with who needs to know about his autism. It isn’t something I’m ashamed of, but do I owe my co-workers who don’t know him an explanation of why he is sitting there talking to himself if I have him in my office for a couple of hours after school? Thanks for your perspective, Ruth. You’re a lot farther in the process than I am, and certainly by the time he’s a young adult, you’re not talking *for* him anymore, and that changes the equation. I think one of the other differences between DS and autism in terms of “when do you talk about it” relates to the diagnosis age. Our daughter wasn’t diagnosed until age 4.5, and even then didn’t have the language skills (receptive or expressive) to have a conversation about what makes her tick. She does now, and she is becoming curious now, and so I’m trying to find appropriate positive ways to share with her. Her siblings are younger than her, and while apparently NT don’t seem to notice anything in their sissy…as one of your readers noted ASD is “invisible”, and in our daughter’s case is pretty mild, so it will be a while before they start asking questions, but I know it will come. When they do we’ll begin to explain to them, too. If we had had an older child a. we might have known our daughter’s development was different earlier and b. we would have had to explain things to the sibling a lot earlier. It depends so much from family to family, and based on so many factors. We’ve always been open with others (not total strangers, but people who interact with her frequently or have children who do) and now we’re trying to be open with her in a way that is appropriate for her. I do agree that straightforward and positive explanation is the way to go! Found this through your comment link on 5MFSN and am going to follow you since our blogs fit a similar niche. Thanks for your thoughts on this subject! Yes, that makes a big difference. In a lot of ways we have been really blessed–the interventions, etc., are not ever in question because her diagnosis came at birth. It must be really hard to live with the uncertainty until dx is done.